This trick can work for any mono instrument source you get. Very often I hear mixes where someone has taken a mono guitar and panned it to one side and then panned a delayed version of the same guitar to the opposite side in an attempt to create stereo width. This never seems to sound that satisfying, even giving the feeling that there are phase/polarity issues. The way to combat that is to adjust the pitch of the delayed source. By simply flattening the guitar a few cents the width is properly created and also gives a very cool guitar sound! Many delays, like the stock Avid one I used in the demonstration have Pitch Change built in, however if they don’t you can simply add pitch before the delay to create the same effect! Applying modulation before a Reverb creates a simple way to add depth and width to the sound you send to it. Often taking a dull, uninteresting sound and giving it a new lease of life in your mix! Try it not only on Stereo Strings/Pads, but Pianos, BVs, and lead guitars they will really come to life, pushing the instrument or vocal forward. This idea adds weight to your snare which can’t simply get from EQ. I stole this from Jack Douglas, he told me he, Jay Messina, Shelly Yakus and Roy Cicala all did it to add low end to their snares. Bring your snare down one octave, then using a tuning software such as Autotune or Melodyne read the pitch of the snare, adding additional pitch adjustment until it reads in the key of the song. It isn’t always possible to tune your snare to a note, however when you bring it down one octave any tone that might be there will be very evident. If there’s no tone, then bingo, you’ve got a fat low snare you can blend in! Blend to taste! 4. Add Body to Your Vocal By Adding An Octave down of the Vocal. A very simple trick, sending the vocal to Pitch Changer that is down exactly one Octave will add body to the lead vocal. EQ the top end off, Low Passing it. There is no need to have high end there which would confuse the main vocals articulation, this is simply there to add bod. Add it gently, as soon as you notice it bring it down, you’ll feel the body it adds but won’t hear it above the main vocal. As I’m sure you can tell I love using many different tricks on vocals! Octaves, Saturation, Reverbs (both short and long, side chain compressed and not! ), Delays (slap back, long delays, short delays, with and without side chain compression) so many ideas you name it! One you will see me talk about over and over again is thickening tricks! Here is the simplest explanation I can do of it! Just simply send your vocal to a stereo pitch change and detune it down one side and high the other! You can repeat this many times, making sure not to repeat the same amounts and also keeping the sides random, if its tuned up one side then that same side would be tuned down the next! For instance I might do the left side -3, +6, -9 and the right side +3, -6, +9! 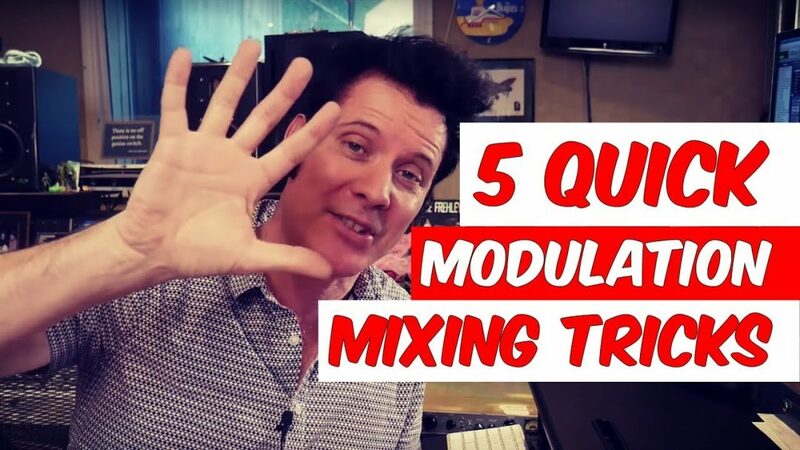 Obviously this is just scratching the surface of many amazing things you can do with Modulation, please share with us your ideas and experiences! Thanks for being a part of our community, it’s marvellous having you here, helping us learn and grow together.